1. "Flaming Guns of the Purple Sage" - July 14th & 15th, 7:30pm at the 1832 Tavern, located at 809 Main Street in Bastrop. Doors open at 7:20pm. Presented by Lost Rabbit Collective, "Flaming Guns of the Purple Sage" is a dark comedy by Jane Martin. Tickets are $25/person, and Student, Senior, Military, Veteran's, Group, and Industry rates are available. 2. Go Fish! Learn to Fish Event - July 15th, 9am-12pm at Buescher State Park. Learn the basics of fishing through fun, hands-on activities. Take away a fishing fun pack and enter the drawing for door prizes. Equipment and bait provided. No fishing license necessary. Free after park entry fees. 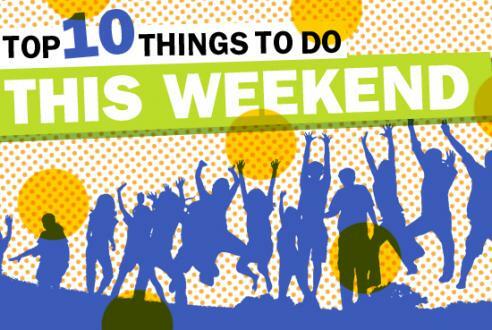 *For more Buescher State Park events, click here. *For more Bastrop State Park events, including Art in the Park: Colors of the Wind Watercolor, click here. 3. Elgin Beach Party - July 15th, 10am-2pm at Elgin Memorial Park, located at 310 N. Main Street in Elgin. Enjoy some fun in the sun! There will be a sandcastle contest, hoola hoop contests, waterslides, lemonade, watermelon, and more! Admission is FREE! 4. Author Meet & Greet: Ruth Meyer - July 15th, 11am-1pm at Living Room Books & Gifts, located at 301 Hwy 71 W in Bastrop. Come meet Ruth Meyer, author of "Grace Alone" and "Our Faith from A to Z." Admission is FREE! 5. 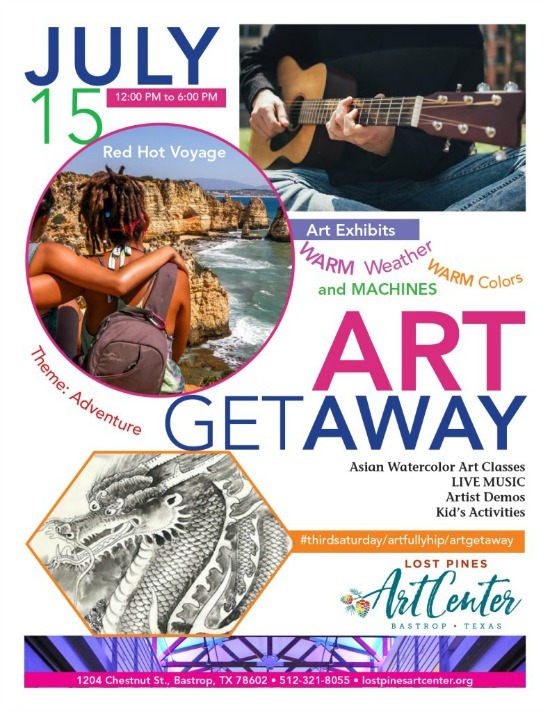 Art Getaway: Adventure Awaits **FEATURED EVENT** - July 15th, 11am-6pm at the Lost Pines Art Center, located at 1204 Chestnut Street in Bastrop. Enjoy free activities including oil painting and pastel painting demos, wine tasting, Middle Eastern Dance Performers, light catchers community project, kids stained glass project, and more! You can also sign up for Watercolor Asian Painting with Mark Bray from 11am-1pm or 3-5pm for $25/person per session. Admission is FREE! 6. Palettes and Paintings - July 15th, 2-4pm at The Front Room Wine Bar, located at 116 Main Street in Smithville. Painting supplies provided. $25/person. Call (512) 237-3626 to reserve your space. 7. Brique Hot Yoga Happy Hour - July 15th, 4-5pm at Brique, located at 19 N. Main Street in Elgin. Hosted by Body and Shine Wellness with Katy. There will be a 1 hour yoga practice in the upstairs banquet room followed by happy hour drinks downstairs. $15 for yoga only; $20 for yoga + your choice of 1 glass of house wine or 2 draft beers. *You can also enjoy Yoga! in the Park! on July 16th from 8:30-9:45am at Neighbor's Kitchen and Yard, located in the Crossing at 601 Chestnut Street in Bastrop. 8. Cotton Bowl Speedway Racing - July 15th, 6:30-11:30pm at Cotton Bowl Speedway, located at 1175 CR 202 in Paige. Gates open at 5pm, races begin at 7pm. Plus, kid's bubble gum blowing contest at intermission! General Admission: $15/Adult, $12/Military, Seniors, & Students, $5/Child ages 6-12, Children 5 & under FREE; Pit Pass Admission: $30/person. 9. Pecan Pie Eating Contest - July 16th, 1pm at Berdoll Pecan Candy & Gift Co., located at 2626 Hwy 71 W in Cedar Creek. In celebration of National Pecan Pie Day, Berdoll will be having a pecan pie eating contest, along with 25% off all pecan pies! Winner gets 1 free pecan pie each month for a year!!! Must sign up in advance to participate. 10. Community Drum Circle & Potluck - July 16th, 5-9pm at Fisherman's Park in Bastrop. Bring a drum (or borrow one from Paul) and a lawn chair along with your favorite potluck dish and drinks and come drum by the river! Admission is FREE! Don't miss out on this **FEATURED** special from Allison Edmon Photography!!! 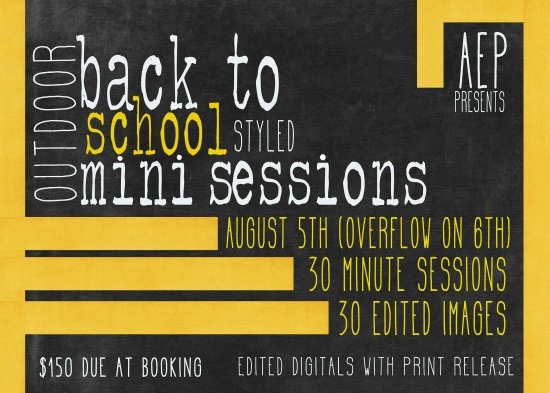 She's offering 30-minute Outdoor Back to School Mini Sessions on Aug. 5th & 6th at an Elgin location for $150/session, up to 5 kids and 30 edited images. More info here.